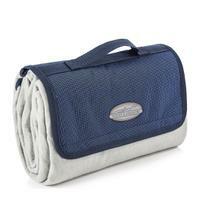 This fleece picnic blanket is ideal for a range of outdoor activities. The fleece topside is comfy and cosy, perfect for a leisurely picnic in the sun or a well-earned rest on a hike. It has a waterproof bottom side which will keep your bum dry, and it folds up neatly to a very convenient size to make it easy to carry - especially with the handle on top.